We envision a future for Hawaii in which educational excellence supports innovation, investment and opportunity in a diversity of fields from traditional ones such as organic farming and sustainable fishing to energy, information technology, and scientific research, development and discovery. 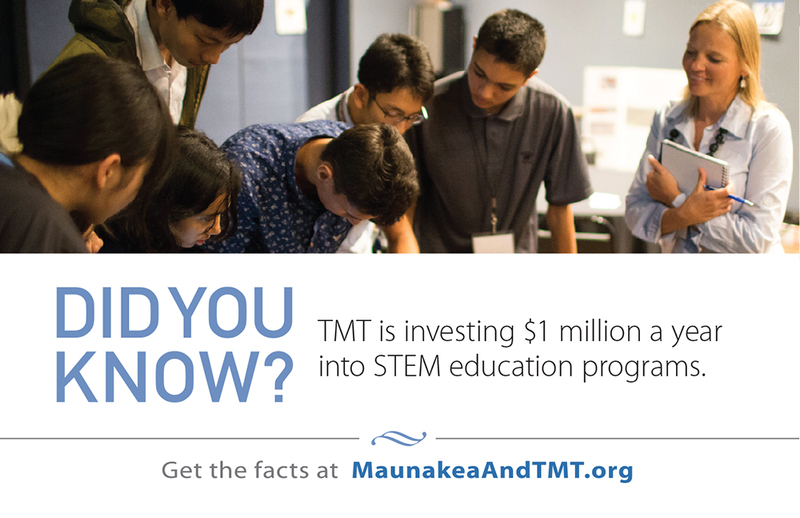 TMT supports a number of educational initiatives to help prepare Hawaii Island students for science and technology jobs. In conjunction with the University of Hawaii at Hilo (UHH), Hawaiʻi Community College (HCC) and the Department of Education, TMT will form and sustain a Workforce Pipeline Program that will lead to a highly qualified pool of local workers. Currently, the project funds, supports and participates in programs that are committed to helping Hawaii Island students achieve success at becoming self-directed, lifelong learners who think critically and creatively and function as caring, responsible, productive members of society. 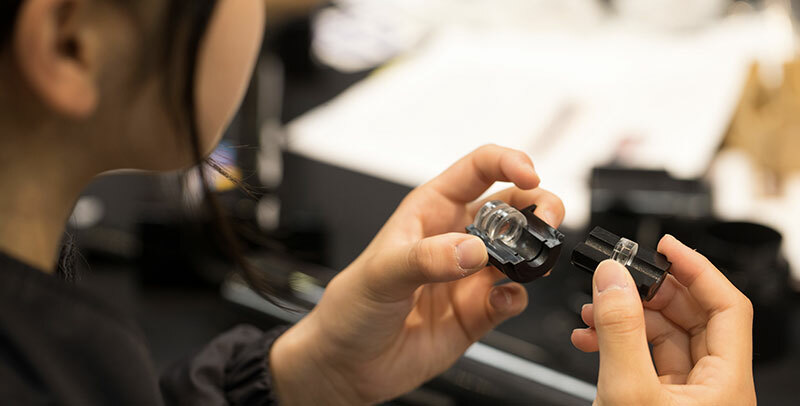 TMT is a cornerstone supporter of the Akamai Workforce Initiative, which provides college students with summer internships at observatories and other high-tech companies in Hawaii. 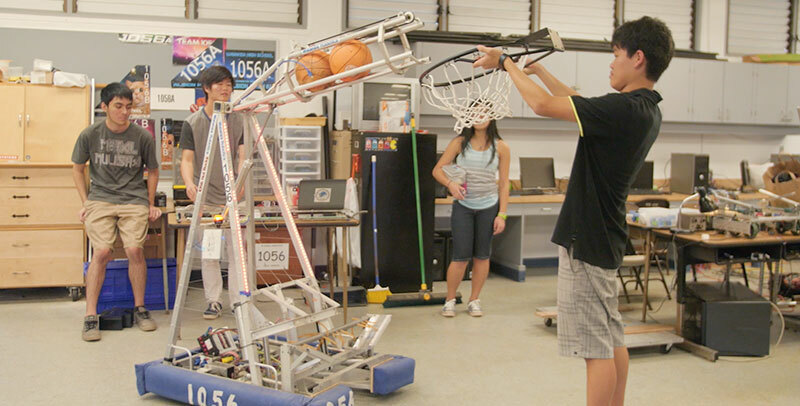 The goal of the program is to advance Hawaii college students in STEM and to increase STEM participation and success among underrepresented groups. Since launching in 2003, more than 350 college students have participated in the Akamai program and at least 150 alumni are now working in science and technology jobs, with nearly two-thirds of them working in Hawaii and contributing to the local STEM workforce. The Thirty Meter Telescope International Observatory sponsors the TMT Early-Career Initiative: a program to provide professional development for early-career scientists and engineers across the TMT partnership (Canada, China, India, Japan, the University of California, and Caltech), and foster international collaborations among the future TMT instrument builders and scientific users. Run by the Institute for Scientist & Engineer Educators (ISEE) at UC Santa Cruz (UCSC), the program leverages the expertise of current TMT project leaders to help early-career participants define science and instrumentation requirements, practice project management, and plan ahead for specific operations and data analysis modes that TIO may support. The program is designed to maximize the productivity and impact of scientific campaigns with TMT, fully utilize the expertise and diversity of the international partnership, and equip young professionals with leadership and project skills they will employ in a multitude of career paths. The centerpiece of the Early-Career Initiative is a weeklong workshop bringing together graduate students and postdocs from all of the partner countries and institutions. The workshop includes three major strands: (1) a series of overview talks by TMT project leaders such as Project Manager Gary Sanders and Systems Engineering Group Leader Scott Roberts; (2) a series of activities wherein teams of participants articulate science goals, devise later-generation TMT instruments that can meet the corresponding science requirements, and present their design concepts to an expert panel and a peer-composed Science Advisory Committee; and (3) collaborative work on “mini-projects” devised by TMT project leaders, that will directly inform the observatory’s science, operations, and data management requirements. The two latter strands mix participants into international teams and require direct collaboration between scientists and engineers. The second annual workshop hosted 42 participants at UCSC in August 2017, and included a poster symposium for participants to showcase their research or engineering work to TIO and UCSC campus leaders. More information about the workshop agenda is available at https://isee-telescope-workforce.org/workshop_aug_2017. In 2018 and future years, the TMT Early-Career Initiative will extend beyond the annual workshop to increase the involvement of graduate students, postdocs, and junior-level engineers in collaborations spanning the TMT partnership. With continued support from TIO, ISEE is developing structures for projects sparked at the workshop to persist afterwards, for participants to prepare for specific roles on TMT International Science Development Teams (ISDTs) or existing instrument teams, and to align participants’ collaborative endeavors as part of TIO with the career expectations and workforce development goals of their home countries and institutions.